Three year's ago today, my maternal grandmother, Liselotte 'Oma' Haf, passed away peacefully in her assisted living home, in Augsburg, Germany. Oma's wishes were to be buried here in Southern California. Rest in peace . . . Schalf Gut . . . Schlaf in himmlischer Ruh . 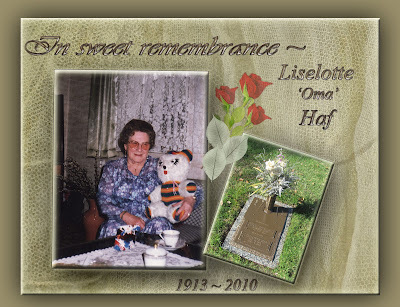 . . we miss and love you very much, Oma.